We focus on dreams with our eyes closed, but we move towards our goals with our eyes wide open. We go to bed with our dreams, but our goals get us up in the morning. Dreams are passive, goals are active. Dreams are in our head, goals are on paper. Dreams linger for years, goals get done. Dreams make us feel comfortable, goals ensure that we are uncomfortable enough to start moving. Dreams are intangible and immeasurable, goals are specific and practical. Dreams are a great starting point, but goals lead to the finished product. 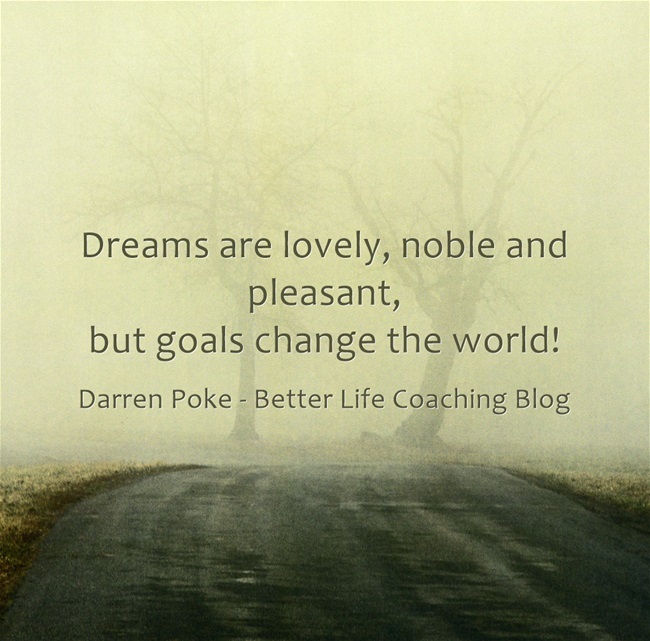 Dreams are lovely, noble and pleasant, but goals change the world! It’s easy to fall into the trap of fantasising about our ideal future and getting stuck in our dreams. Today, I want to encourage you to turn your dreams into goals so that you can create that ideal future and live the life that you were born for! Previous post – What Are Your Kids Invisibly Learning From You? « What Are Your Kids Invisibly Learning From You?